I love trying new recipes over the weekend. There’s plenty of time to run to the grocery store, pick fresh ingredients, and experiment a bit with no time limits. Plus, I had some surprise guests this morning! My parents decided to haul a few furniture pieces I inherited from my grandmother, which I gladly accepted! I’m so excited about my new dining table and wanted to serve up something special so we could sit and enjoy. My dad loves chicken pot pies. If Publix is having a 10 for 10 deal on them, he will have 20 in his cart. So, I wanted to try to make one while they were here. I looked up a few recipes online, deciding to combine a few things I liked from each of them to make this one. So here you go, my completely from scratch chicken pot pie, baked in my cast iron skillet. I washed all my veggies, and the chopped up the celery, potatoes, and onions so I could just pop them in the pan. I stored everything in the fridge until I was ready to cook. 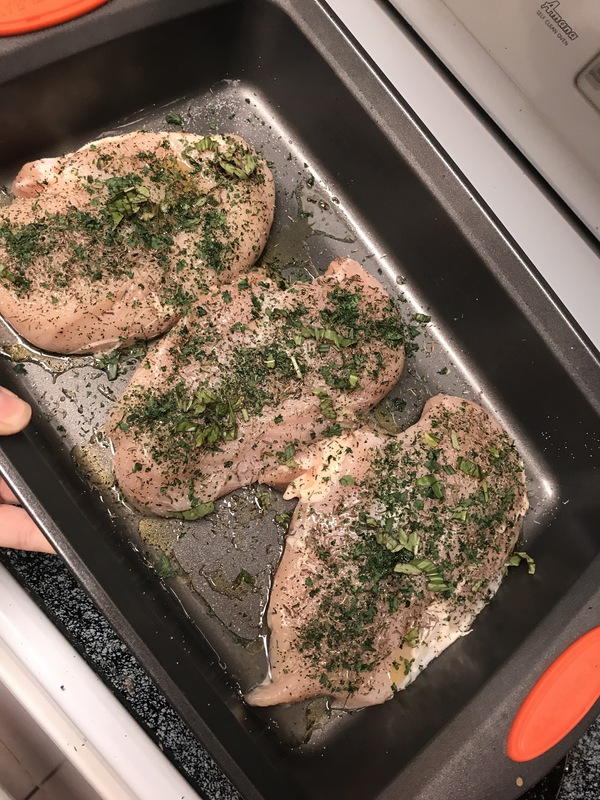 I also diced up the chicken breast into bite-sized pieces. Lastly, I whisked together flour, parmesan, baking powder, sugar, and Kosher salt. I put the mixture in fridge until I was ready to add milk and drop in the pan. Thinking back, I could have added the milk/butter then, but didn’t. We had unloaded most everything, and my dad was working on my dryer. I knew he’d be getting hungry soon! Heated up 1 tablespoon of oil in the cast iron skillet. Added 1/4 cup of onions, and let them simmer. Pushed the onions to one side, and whisked in a tablespoon of flour for a light roux. Added celery, carrots, peas, and potatoes to cook, for about 10 minutes. Added 3/4 cup of milk and 1/2 cup of chicken broth, cooked for another 5 minutes. I also added just a little more flour to thicken it up a bit. Add the chicken back to the pot, let warm. Drop biscuit mix into the skillet for the top layer. I tried – unsuccessfully to use an ice cream scoop – but ultimately I stuck with my spoon and sliding it off with a forefinger. Bake for 12 minutes at 425. Sprinkle a little parsley on top and serve it up! Well, my father approved his meal with a clean plate, so that’s for sure a win! I highly recommend this recipe — it’s very simple, and the parmesan biscuits topping gives it that little something extra. It needs a little more of the juicy “filling.” Adding cup of cream of chicken to the skillet – prior to popping down the biscuit mixture – would have done the trick. It was just a bit too dry. I wanted the biscuit to soak up a little more of the cream once I was eating it! Also – carrots = yuk. I’m just not a carrot fan. My mom suggested cooking those a bit more before adding to the skillet or use canned. Anything to help them cook a little more would have helped. Also – I have a new challenge for myself: Take photos while baking/cooking. I can only seem to remember to snap a few photos after the meal is done. I must be better about this! Have any great recipes you’ve tried recently? I’d love to know in the comments! Finger lickin’ good, but roasted! I’m on a health kick. At least, I’m trying to be on one. As of 12:40pm, I’ve downed 1/2 my water intake. Eggs for breakfast, and a Mediterranean Quinoa Salad for lunch. Normally, when I meal plan or make salads at home, I always leave off the meat. Maybe because I felt like it takes so long to cook it safely, or it was more expensive. I usually opt for frozen but ready to microwave chicken, or even a rotisserie from the deli. No more! This was SO EASY. I think this idea stemmed from a Tasty video, but I can’t remember! Regardless, I purchased three chicken organic chicken breasts from my local grocery store. I washed them and placed them in a roasting pan, and then poured about two tablespoons of EVOO on top. I sprinkled salt and pepper over each one, followed by dried thyme. I also chopped up a few fresh herbs from my garden for the top. The pan went in at 7:43 am at 400 degrees and 25 mins later – I had beautifully cooked chicken. I did want the tops to be a little browner, so I turned my oven on broil for 2 min. Perfection! I let them rest and cool before storing in the fridge. I packed one for a topping to my quinoa salad for a quick lunch. It was slightly too much, so I’ll know to only do half the breast slices for the next lunch bag! But the flavors were great with the feta, olives, peppers and quinoa. And, I feel like I did pretty good with the calorie count too! Off to drink some more water 😬 And, more pics on the next post. I devoured the chicken before it ever crossed my mind! I had a great Easter weekend – full of fun, family and plenty of sunshine! With an event on the Saturday before Easter, followed by one of our biggest festivals of the year this weekend, I knew I was going to be crazy busy with not a lot of travel time. So my parents drove down and spent Easter weekend with me. While I managed our event, they shopped ’til they dropped, so it’s safe to say we worked up quite an appetite. So, I cheated with the honey baked ham and sweet potato casserole – purchasing from Honey Baked Ham in Destin. But totally worth it! I also grabbed some dinner rolls from Publix. I don’t know the last time I boiled eggs, so I had to look it up in my cookbook. Basically, you start with cold water, bring to a boil, and cook to make sure that it’s hard boiled. Check out this helpful graphic for the desired doneness. Slice the eggs lengthwise, and put the yolks in a bowl. Then mix the yolks with they salt, pepper and mayo. The recipe I was following called for dry mustard, but I didn’t have any. I took a zip lock bag, cut part of the corner, and then squeezed them into the egg whites. Sprinkle a little paprika on top! Again – this was an easy addition to my lunch, and fast! Always wash your produce first, and pat dry. Place the asparagus, and toss with olive oil and a little salt. Lay them out on the plan, and squeeze the lemon juice on top. Sprinkle parmesan, and then roast at 400 degrees for 8-10 minutes. I tried this lemon cake for the first time, and want to give Well Plated by Erin credit because it was AMAZING! I’m a little late on posting this one. But, I made an Easter cake this year! My parents decided to come to my apartment for Easter, so we went to church and then had a big meal of ham, corn, butter beans, rolls, and a very special Easter cake! I not really a baker. 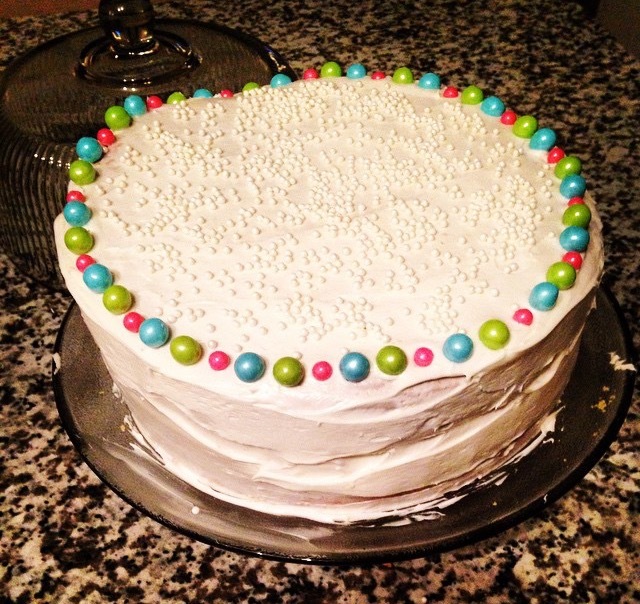 But, I’m trying to challenge myself in the kitchen more this year, so why test my decorating skills on this cake too?! I ran out of time that week, and opted for a cake mix from the grocery store, instead of making from scratch. I planned for a 3 layered yellow cake, and chose whipped vanilla icing for the layers and top. I also bought some beautiful candied pearls to decorate the top. The baking part was easy. I whipped together all of my ingredients and threw three separate pans of batter inside! Once I had my beautiful yellow cake layers baked and cooled, I was ready to start icing. The icing of the cake was pretty fun. It was a lot like painting, very relaxing. Then, it was time to decorate. I alternated with candy pearls, with white in the center, and color pearls all around the outside. Another note to self: My cake did not fit inside my display platter and topper. AND, to make matters worse, I didn’t realize what I had done until it was too late. Thank goodness I took a picture before I smushed my cake. We ate it anyway, and it was delicious.